Larson Electronics’ Magnalight.com has announced the release of the HML-5M-LED Handheld LED Spotlight with magnetic base designed to provide reliable and powerful illumination under tactical and professional conditions. Producing 3,600 lumens and pulling only 1.6 amps on 24 volts, this handheld LED spotlight is based on Magnalight’s proven HML series of military spotlights that have seen use in Iraq and Afghanistan as a part of the Military’s Escalation of Force Kits. Operating on any voltage from 9 to 32VDC, this LED spotlight produces a 1600' long by 120 feet wide beam and will withstand operation under highly demanding conditions. We have taken our classic Escalation of Force Kit gunner’s light with magnetic base and equipped it with a 40 watt LED light. The Magnalight HML-5M-LED Handheld LED Spotlight offers operators in military, law enforcement and professional utility and emergency services a powerful and efficient alternative to traditional halogen and HID equipped spotlights. Equipped with Magnalight’s waterproof PAR46 solid state LED bulb, this LED spotlight light produces more light while consuming less power. This means longer run times when operated from vehicle and equipment electrical systems without draining batteries. The rugged weatherproof and UV resistant housing and LED lamp in this unit provides excellent durability and reliability while a 100 lbs grip magnetic base provides simple and secure mounting to metal surfaces. 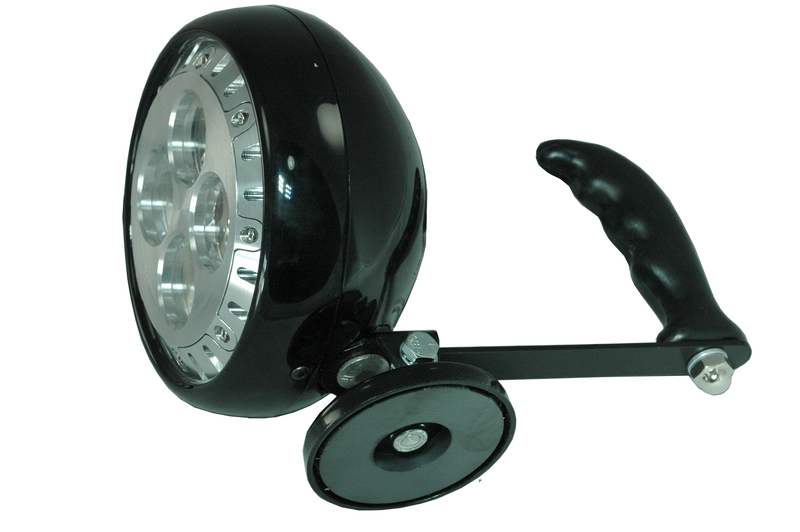 A polypropylene handle and heavy gauge steel handle bracket provides easy positioning of the light. This LED spotlight is also available in blue, green, amber and red colors as well as 850nm and 940 nm 12 watt infrared versions for use in covert operations in conjunction with night vision equipment. A variety of power connections are available including 16 and 25 foot straight cords with cigarette plug, 21 foot straight cord with battery clamps, 16 foot straight cord with battery ring terminals and 16 foot coil cord with cigarette plug. With a housing made in the USA and an LED lamp that is Made in the USA compliant, the HML-5M-LED Handheld LED Spotlight produces more light of a higher quality than comparable halogen spotlights, while providing unmatched durability and efficiency. Magnalight by Larson Electronics carries a wide array of LED lights, infrared light bars, infrared and visible light LED spotlights and offers a comprehensive selection of the latest and best in industrial and commercial lighting technology. 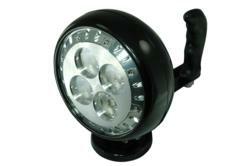 View Larson Electronics’ full line of LEDs and infrared LED lights by visiting Magnalight.com. Contact Magnalight by calling 1-800-369-6671 or 1-214-616-6180 for international inquiries. Operating on any voltage from 9 to 32VDC, this LED spotlight produces a 1600' long by 120 feet wide beam and will withstand operation under highly demanding conditions.Producing 3,600 lumens and pulling only 1.6 amps on 24 volts, this handheld LED spotlight is based on Magnalight’s proven HML series of military spotlights that have seen use in Iraq and Afghanistan as a part of the Military’s Escalation of Force Kits.